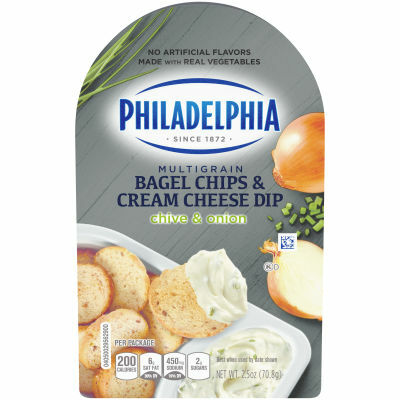 Philadelphia Bagel Chips and Chive & Onion Cream Cheese Dip is a convenient and flavorful on-the-go snack that is easy to carry anywhere. The deliciously smooth cream cheese dip pairs perfectly with multigrain bagel chips. The chips and cream cheese dip stay separated in this convenient 2.5oz tray, enough to fill your snack cravings any time of day. With no artificial flavors, this is a snack pack you can feel good about. Serving size 1 package (70.8 g).